It's a big birthday for the Princess this year. She's turning 8! To celebrate we decided to throw a Spa party. We're going to have a whole gaggle of little girls over to be pampered...facial masks, painted nails, the works! colored cardstock - now, I just happened upon some cute oval notecards at Target that I knew would make my life easier for this project. They were just the right size, in the right colors, and they included envelopes. So I bought two packages. stick glue - my glue of choice when doing paper crafting. 1. The first thing I did was cut out a template. I should probably have done this using printer paper or something. But because I trust too much in my mad skills, I just started cutting one of the notecards. Then I ended up having to fold it in half to get it even, so I couldn't use it. Luckily, I had more cards than I needed, but HELLO? 3. Cut out all the pieces you just traced. 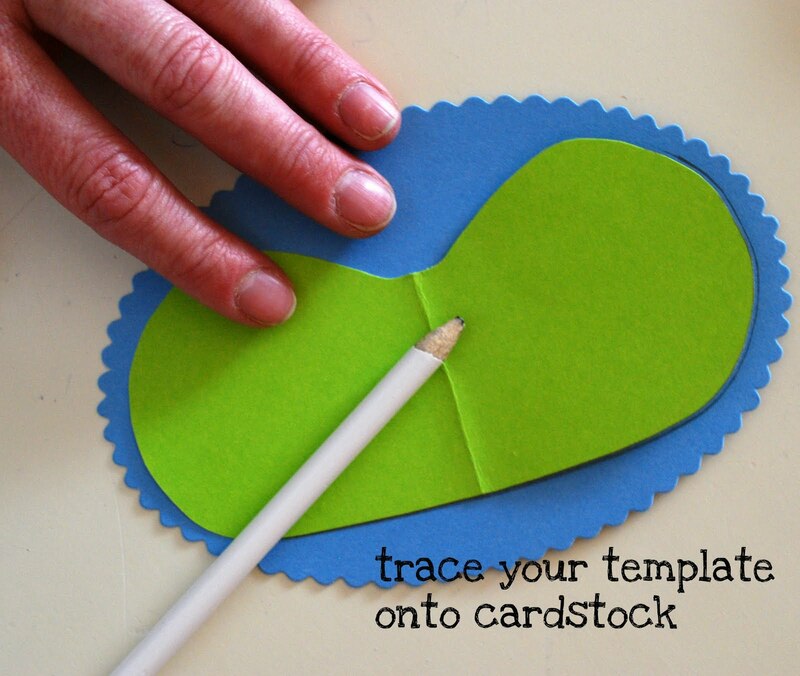 Since you probably wont be using notecards like I did, you will also want to cut rectangular pieces of cardstock in a coordinating color that are big enough to glue the cut pieces on and still have a border around the edge. 4. Now cut lengths of ribbon. I cut them long enough so that they could actually tie around a person's head. 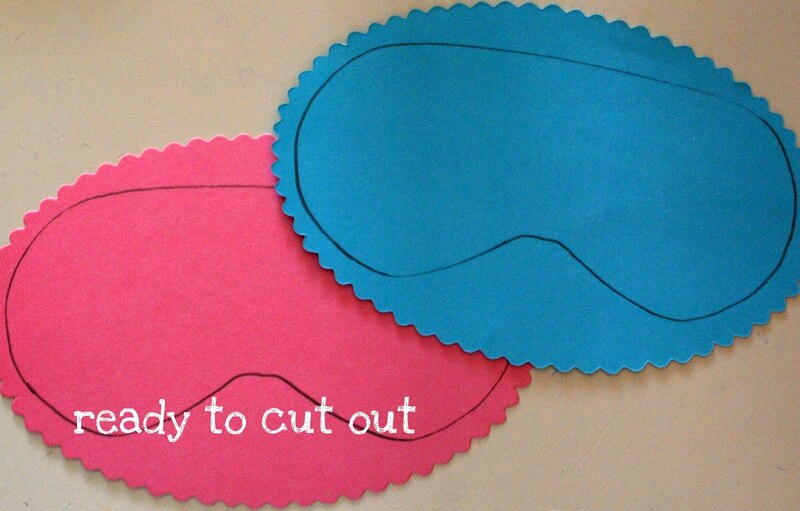 Of course you can cut them shorter if you so choose...just make sure that they are long enough to fit across the width of your sleepmask and still have ribbon dangling on both sides. 5. Using the stick glue, cover the back of your cut pieces entirely, then put a stripe of glue across the approximate center of your rectangle (remember I'm using the oval notecards...that's why there's no rectangle pictured). 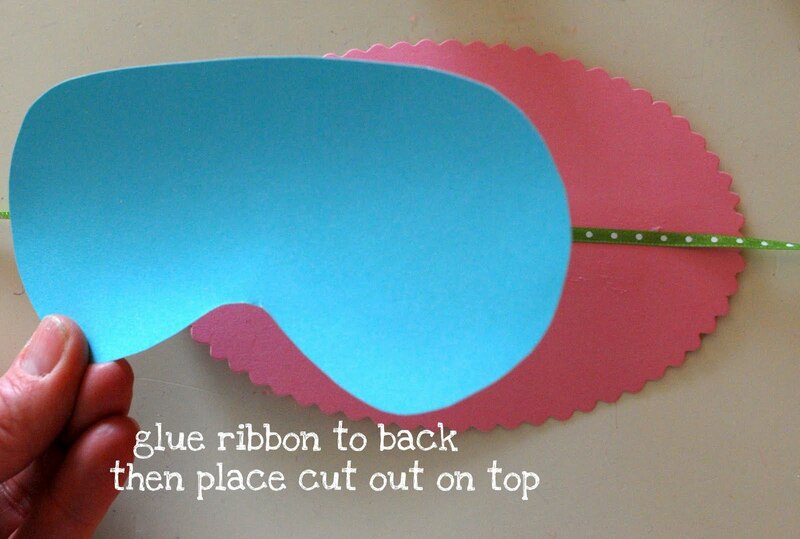 Lay the ribbon across the stripe of glue and then place the cut piece over the top. 6. Now using your scallop edge scissors, cut the rectangular piece to the same shape as the cut piece leaving approximately 1/4 inch showing. 7. Tie a card with the party details onto one of the strings. 8. 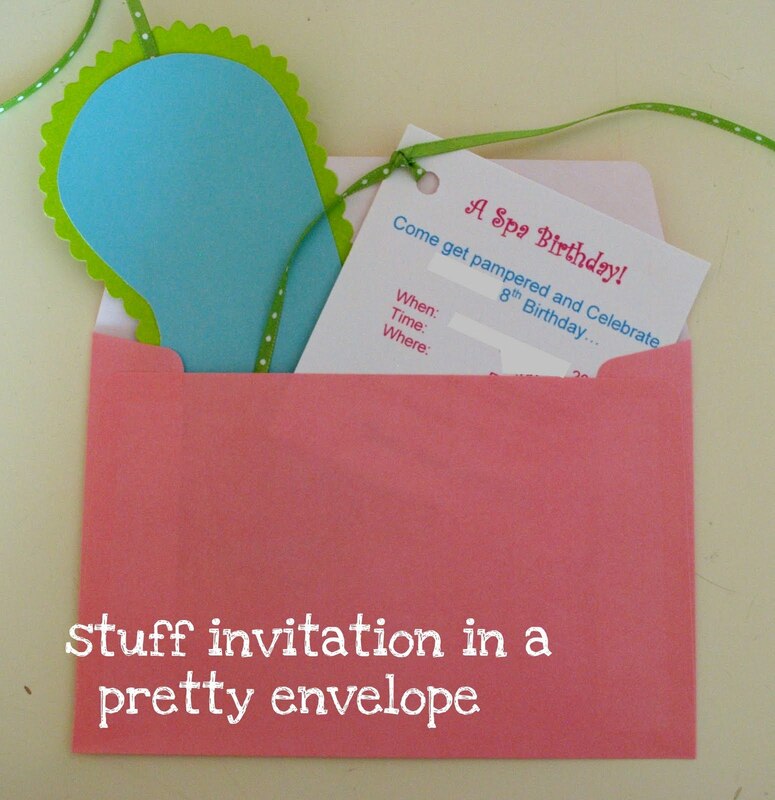 Stuff your finished invitation into a cute envelope for delivery. There you have it. 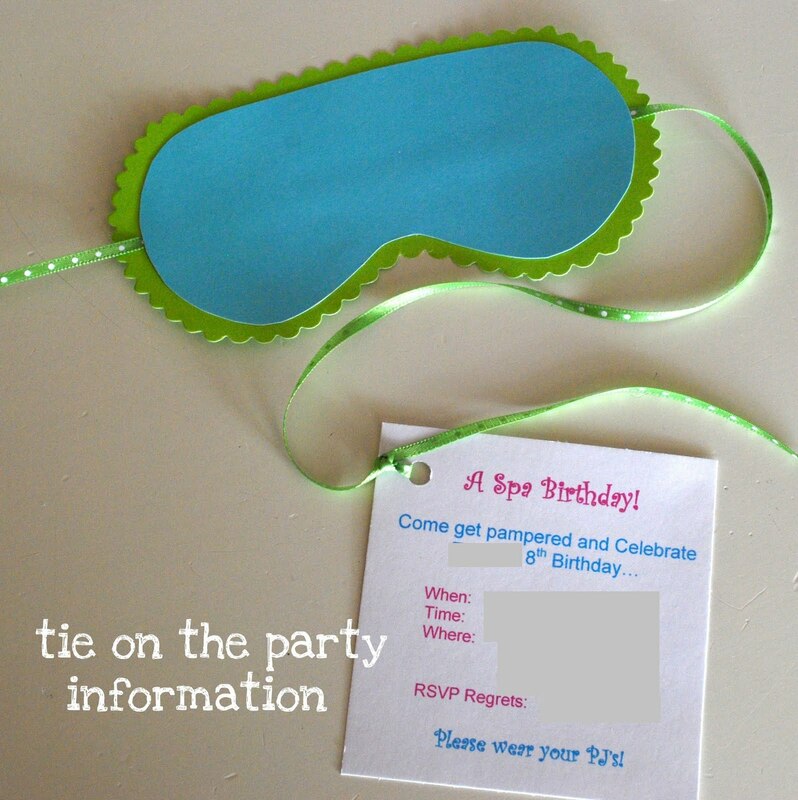 Easy peasy Spa-themed invites. Enjoy! 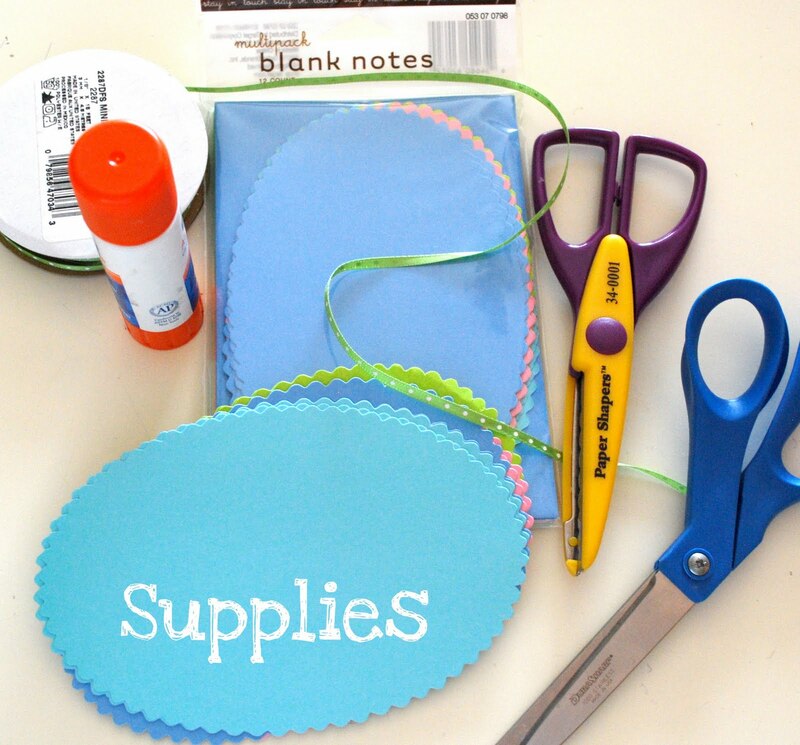 Get Your Craft On Tuesday at Today's Creative Blog. What a great Idea, How lucky,to have a spa party.. The invitations turned out awesome! What a fun invitation! I love getting something creative in the mail. So cute they are going to have so much fun!!! If I lived next to you I would do all their little nails for free... have a Happy Birthday. I hope I have a daughter someday so we can do something like this! These are adorable, thanks for taking the time to photograph the process. I know your daughter is going to have a great time! Hi Wendy, I've been reading your blog for a long time, but this is the first time I've ever commented. I love your blog! 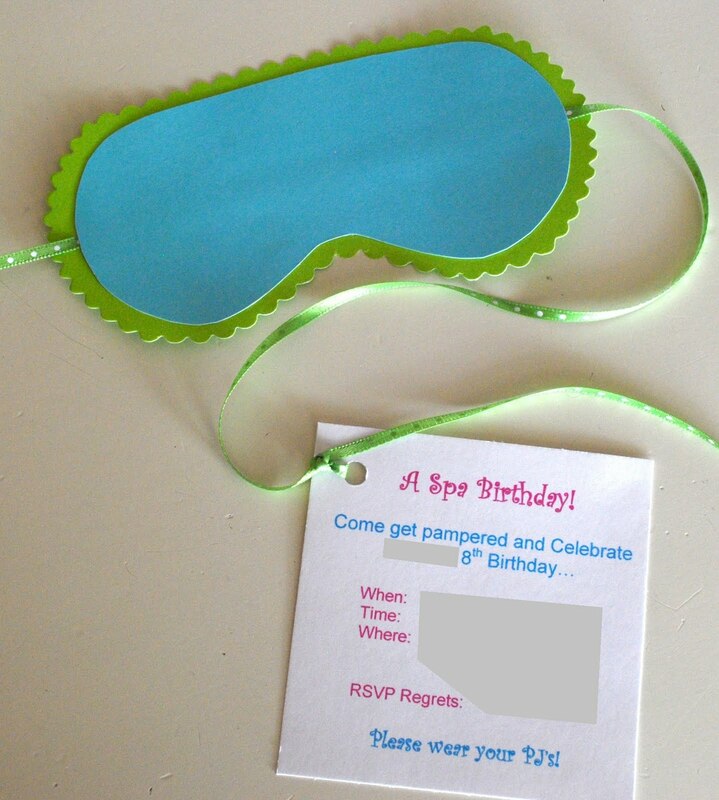 I have an 8 year old who has wanted a spa birthday party forever. She and her friends would go crazy for these invitations! I can't wait to see what else you do for the party. Loved the pirate themed party you organized for your son, as well! What a darling idea! I am sure it will be a hit! those are just adorable! what a fun girly theme! love it. ohhhh such a cute idea... birthday season is about to start in a few weeks at my house... i need these ideas! What a great invitation and happy bday to the princess. What a cute invite idea! You always have great items and ideas to share. 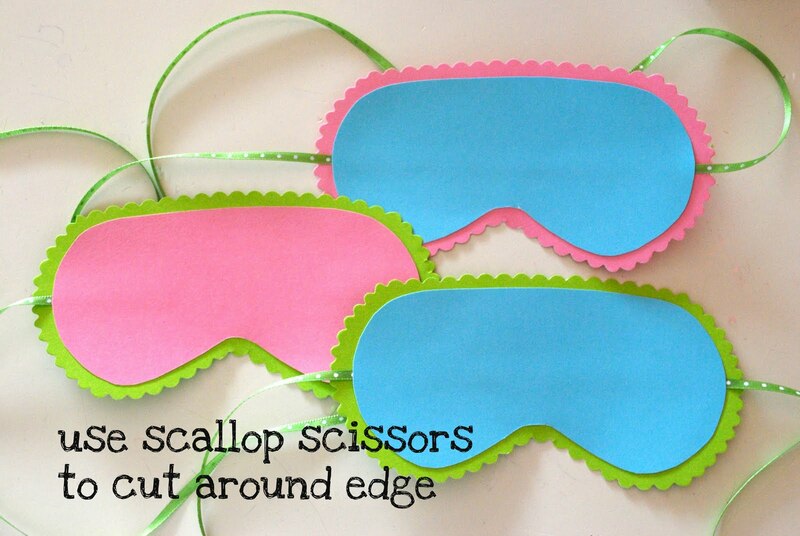 Thanks so much for sharing them and hosting the linky parties. We are big fans of your blog so we awarded you the "Stylish Blogger Award." Please follow the link to get the details.